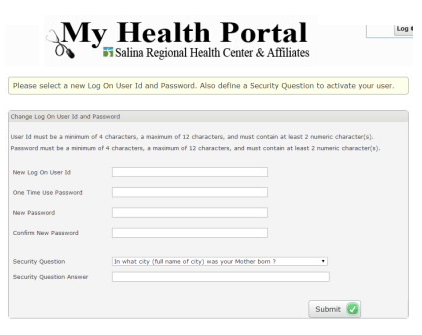 To self-enroll to My Health Portal, you need to be an existing patient of Salina Regional Health Center or Affiliates. 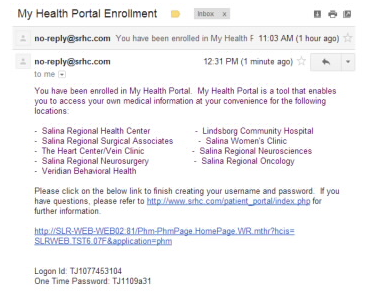 Before you can self-enroll, we need to have your email address on file. 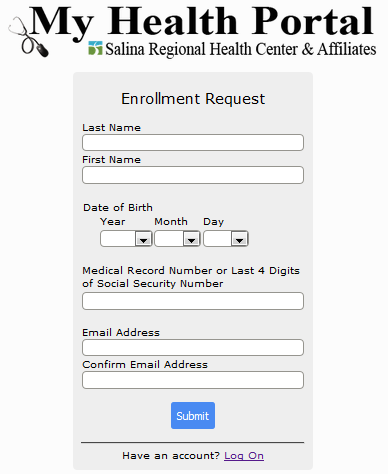 If you are not sure if we have your email address, please contact our Health Information Management Department at (785) 452-7152. 1. 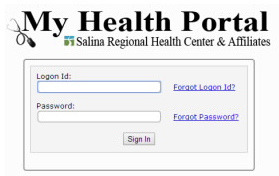 From the hospital webpage, click on the “My Health Portal” link. 2. Click on the “Set Up Your Account” button. •	Medical Record Number – need to include the letter prefix and any leading zeros. You may enter the last 4 digits of your SSN if you do not know your Medical Record Number. 4. Click Submit. A temporary username and password will be emailed to you. This is a security measure designed to protect the privacy and integrity of patient records. It may take up to 20 minutes to receive your temporary password. If you don’t receive this email, please check your junk folder. If you still did not receive one, please contact our Health Information Management Department to have a new email sent at (785) 452-7152. 5. Within the email, click on the link provided. You will be taken to the login page. Enter your temporary Logon Id and One Time Password shown in the email. You will then have the ability to create your own User ID, Password, and security question. Once these have been created, you have been officially enrolled into My Health Portal.